What’s for dinner, Ma? That’s a big question absentmindedly asked by anyone in our family every single night and I know in yours too. This easy and common question can actually be hard and taxing for many moms with so much at hand. Hence, the simple solution is to come up with a meal plan for the week. The good thing about having a meal plan, is that it'll allow you to cook meals within your budget, eat healthy, save time, , add variety to your food and most of all lessen your stress. So today, I’m going to share with you my carefully crafted 5-day dinner meal plan. I’ll be making 5 dinners with US Potatoes as the main ingredient. Potatoes as we all know are the most versatile of all veggies that blessed the Earth. Its culinary prowess can go well with anything, whether its haute cuisine, home cooking or even backcountry camping cooking. They’re not just versatile tubers, they’re also energy and nutrients-packed to let your family perform their best and power your kids for the day. 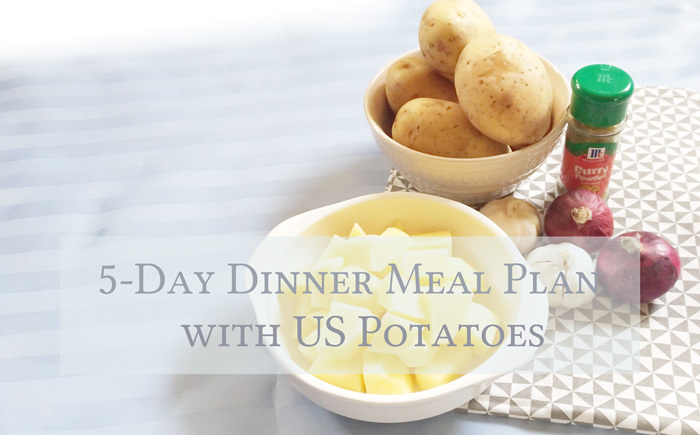 In this meal plan, we’re going to use US Potatoes in all of our recipes. I love US Potatoes because they’re family farm grown in the US. The farmers that grow these potatoes follow strict guidelines set by the US seed certification system, thereby producing high quality potato product every time. 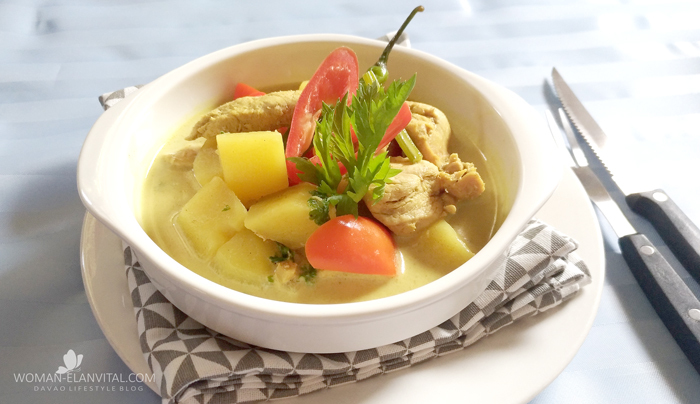 For Monday, we’re going to cook chicken curry. 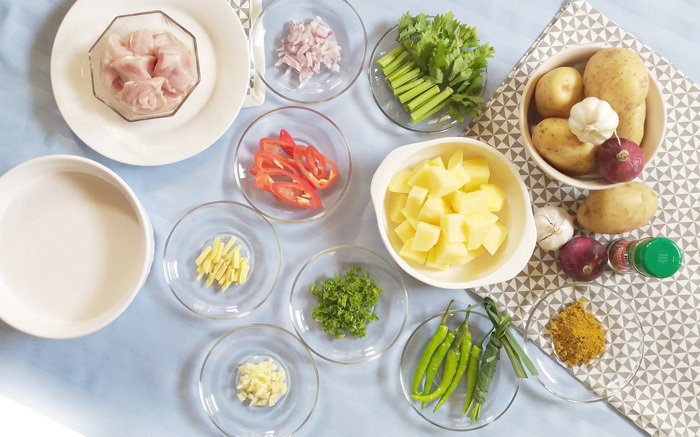 The many spices and herbs that composed curry will make a dish the most aromatic and flavour-rich plate you can ever prepare and serve your family. I love curried food, they’re so full of flavour, but when I cook it at home I bring the curry level down to a minimum because the kids aren’t fans of the heady aroma. This recipe is actually very versatile. When you master the sauce-making part everything else follows. 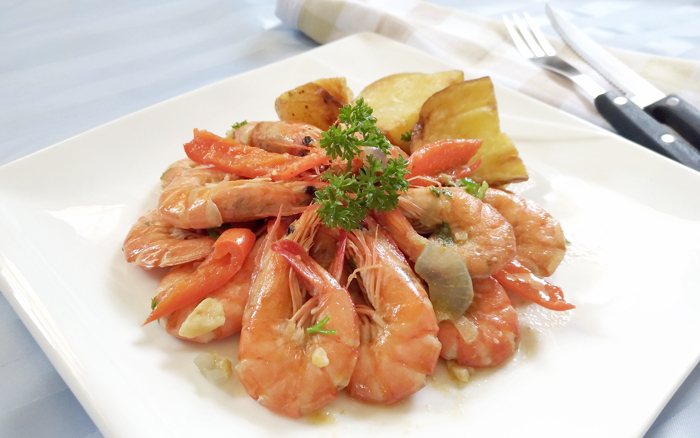 You can use fish, shrimps or mixed seafood, especially sea shells on this one. But today, we’re going to use chicken. This is one of my family’s favourites and I’m going to share this with you hoping this will find a place onyour tables too, one day soon. In a large wok, heat the oil over medium heat. Add the onion, garlic, red bell pepper and ginger. Stir-fry until onion softens. Add in chicken and US potatoes. Simmer a bit and add in water, curry powder and bell pepper. Cover and bring to a boil until fragrant. Simmer until the potatoes are tender. Add the coconut milk then season with fish sauce and pepper and let it boil for about 5 minutes. Add in celery, let it simmer a little bit more and reduce fire to low. Plate and garnish with parsely. Have the freshly cooked rice ready, enjoy! For Tuesday’s dinner we’re going to make another very easy recipe. We’re quite lucky we live a short ride away from the wet market.Oftentimes, I get to catch fresh seafood from my ‘suki’. Marinate Tangigue at least 30 minutes before cooking with the marinate ingredients. Just mix them all together and let it stand. Boil US potatoes until fork tender, drain and set aside. Set grill pan over a stove and drizzle with olive oil. When hot enough, grill the fish, turning each side until it’s done. In a separate skillet, drop in the butter and add potatoes and asparagus (You can add in more veggies if you want – like pre-trimmed baguio beans, cherry tomatoes, broccoli, corn cob, carrots or whatever is available in your kitchen. Just blanche and put them all together in the skillet). Plate, garnish with parsely and enjoy! This recipe has been one of my culinary bestsellers. I love cooking this for any occasion I have a chance to. Not only are shrimps supply plenty and constant, this recipe is also super easy and require less time to prepare. You will need only few ingredients on this one, hence, cooking this recipe can be very convenient. Plus it’s so good, your family will surely love it. Clean and remove shrimp hairs, (if you prefer to remove head, do so) let it drain. 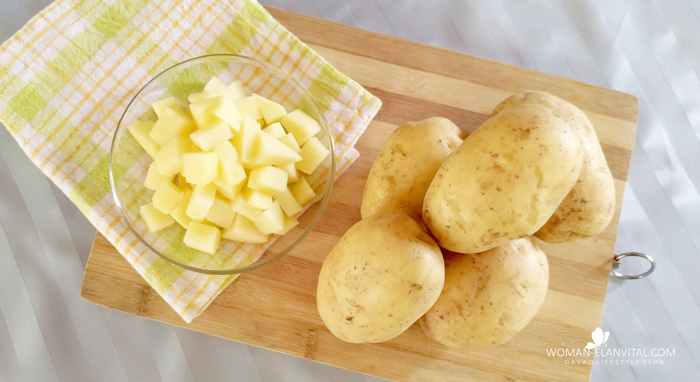 Boil US Potatoes until fork tender, when done, drain the water. In a skillet, pour at least 3 tablespoons of cooking oil. When the oil is hot enough, put in the boiled US Potatoes with the cut part down. Give it a golden brown texture and remove from fire. Then set aside. In a separate pan, drop in the butter. When melted, sauté onions until translucent; Add in the minced garlic, sauté until edges turn browny and crisp then drop in the rest of the spices. Add in the shrimps, fish sauce, pepper to taste and water. Cover the pan and let it simmer for 10 minutes or until the shrimps turn all pink. Boil quartered US Potatoes until fork tender. When cooked, drain and let it stand for about 10 minutes to dry out the water. 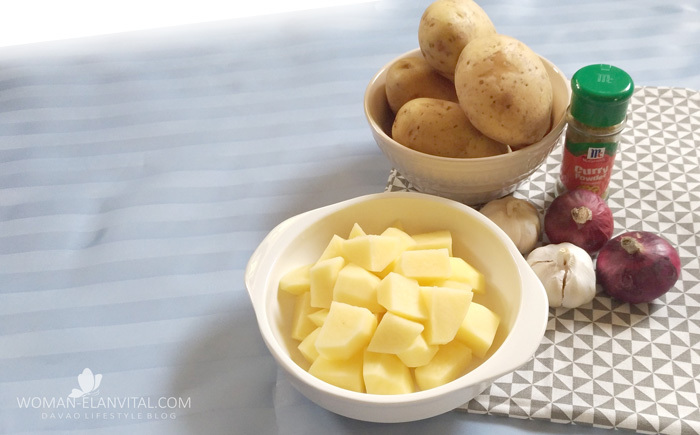 Drizzle the cooked potatoes with salt and pepper to taste. In a pan, pour in at least 3 tbsp of olive oil and place US Potatoes cut down. Give it a nice golden brown crisp texture. When achieved, remove and set aside. Cut chicken into thin slabs. Season the chicken with lemon, salt and pepper to taste. In another pan, melt butter over low heat, put in the garlic until it edges turn crisp. Sear in the chicken until golden brown. Toss in the potatoes and chopped dill. Today I’m going to share my staple salad that I’ve mastered. 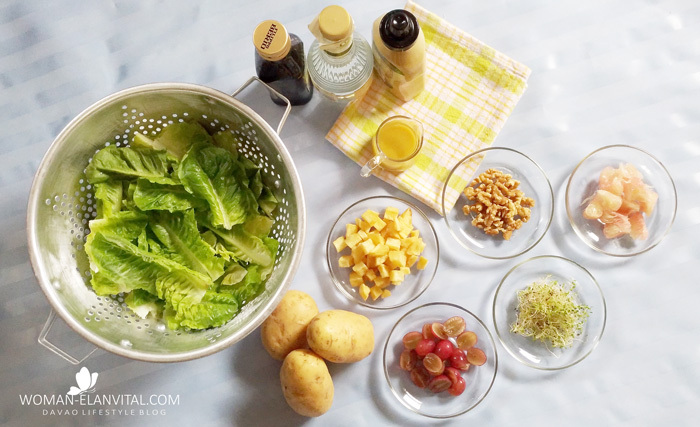 The dressing recipe is a constant but I change and exchange salad ingredients whatever is freshly available in my kitchen. 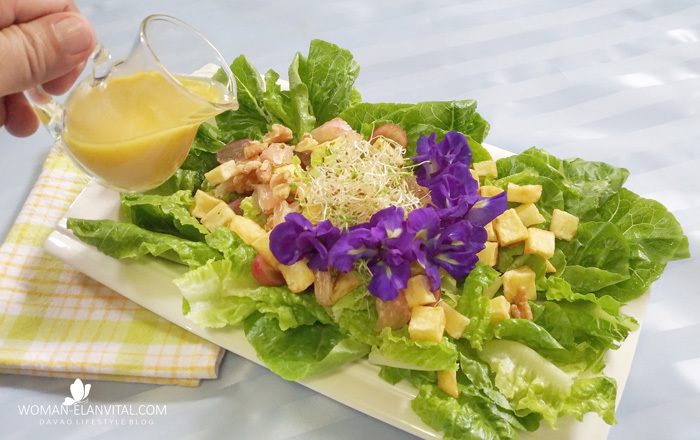 The blue ternatea vine at our sideyard is in full bloom, so I’m having a few flowers on my salad today. Wash and chop Romaine lettuce. If you have a salad spinner, spin the leaves to remove thoroughly excess water. If you don’t have just wash it ahead of time and let it stand in a colander to drain water completely. Wash and halve the grapes. Section pink pomelo. Toast lightly the walnuts. Fry US Potato cubes until crisp and light brown, do not char the potato. Place a medium non-stick skillet on a high heat, pour in 3 tbsps. of Olive Oil (I don’t use butter because it burns easily) when the oil begins to smoke, put in the cubed US Potatoes. Pan fry it until it turns crisp and golden brown. Do not char the potatoes. When done, let it cool a bit and toss it immediately in the salad. Put all ingredients in a bowl and mix thoroughly. Or place it all in a covered jar and shake well. Toss all ingredients and dress your salad. Bon Appetit! US potatoes are family farm grown and follow strict guidelines set by the US seed certification system to ensure that every potato product is of highest quality. U.S. Potato growers employ highly scientific techniques for monitoring soil, water content and plant nutritional needs. Once harvested, U.S. potatoes are stored in carefully designed facilities that ensure the ideal temperature, lighting, humidity and ventilation to preserve the potato’s quality. 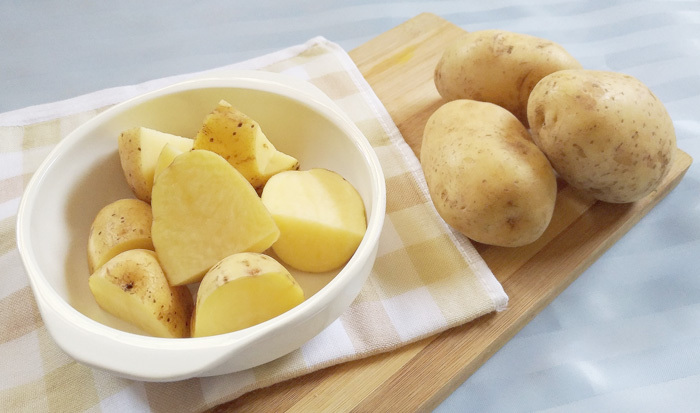 US Potatoes are widely distributed in leading supermarkets in the Philippines. They come as fresh, frozen and dehydrated. I love your flatlayouts. :) My kids are potatoheads, taking the Austrian palate more seriously than that of a Filipino's :/ - can't blame though since that's a staple...that's why this post is a hit to them. Potato everyday! Thanks for sharing...hope I could try all of these yummy recipes soon. Omg I love potatoes, my substitute for rice! Your recipes makes me hungry and crave for more potatoes. Including the sweet potatoes (or kamote). 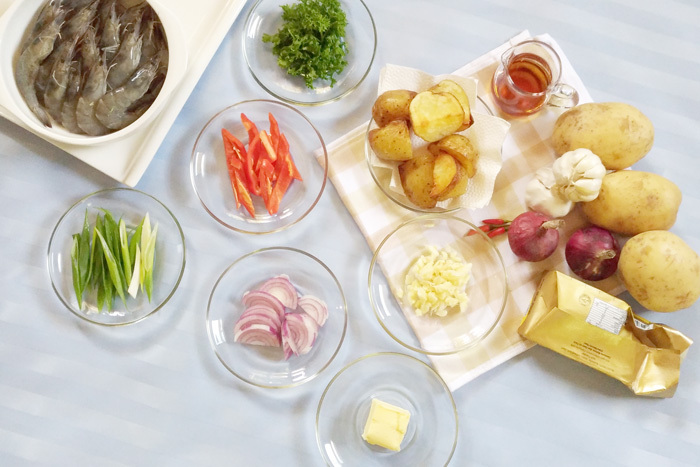 thanks sis, grabe effort sa flatlay hahaha... we're just learning to make this potatoes as alternative to rice lately... and the Pinoy kids at home love it.. can't blame your kiddos, they're exposed to that food culture.. that's why :) thank you for the visit. Interesting recipes. All looks delicious and must try! Can we use normal grown potatoes? Just love your detailed recipes.